Limited time offer. 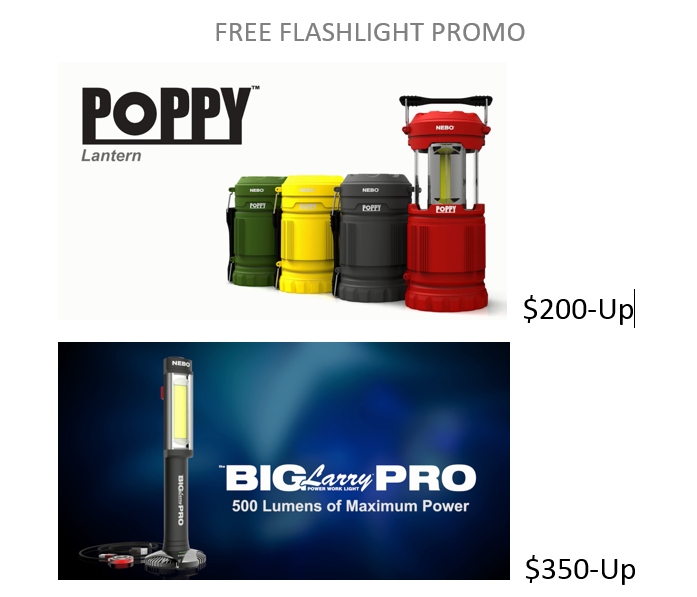 Free Flashlights that are high quality, professional grade. To get your free flashlight you must add the light to your cart and apply the promo code at checkout to make it ZERO cost. OR if you want a more expensive light than you qualify for you can add the light you want to the cart and apply the discount amount to the purchase. Rules/Details: Order total based on parts only and does not include freight. This special cannot be combined with other discounts or promos. Sale can end at any time or when supplies run out. International Orders between $250.00-$500.00 will get the Big Daddy because we cannot ship the Big Larry Pro due to Lithium-Ion battery. Also, we ship the BigLarryPro via ground shipping only to USA and Canada for the same reason.